With your purchase you are automatically entered into a CharityMania sweepstakes (no purchase necessary to play, void where prohibited). Check out the sweepstakes and how you can win! When you support one of CharityMania's participating non-profit organizations financially, you get digital music downloads from the CharityStudio. 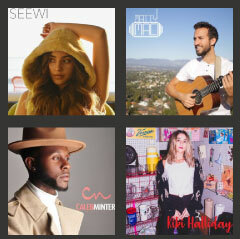 Your CharityMania ticket allows you to download songs from up-and-coming artists from all different genres of music (see a list of all the songs included with your access code). There is nothing else you need to buy or do to download your digital content. Just enter the access code on your ticket and enjoy! How do I get my digital music? To access the CharityStudio and download your music, enter a valid CharityStudio "access code" (typically located in the top right corner of any CharityMania ticket which is attached above a sweepstakes game card). If you do not currently have an access code, please contact one of the many participating non-profit organizations who are using CharityMania to raise money or contribute to our sponsored charity, the Alzheimer's Association. When you contribute to a participating CharityMania organization, you can download music from the CharityStudio and receive a free CharityMania sweepstakes game card. There is nothing else you need to buy. Buy an access code, support a great cause! Thousands of non profit organizations across the U.S. sell access to the CharityStudio to raise money for their great causes. If you already have an access code, enter it above to download your music. If you do not have a code but would like access, you can purchase an access code directly from the CharityStudio and support our sponsored charity, the Alzheimer's Association.